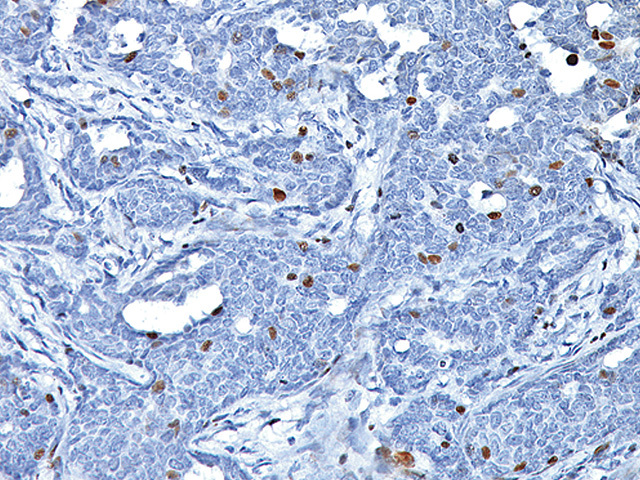 Tumor protein p63 antibody, also known as transformation-related protein 63 is a protein that in humans is encoded by the TP63 gene. 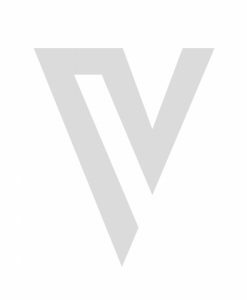 Many studies have shown that p63 is a sensitive (90%) and fairly specific marker for squamous cell carcinoma and may be used in distinguishing poorly differentiated squamous cell carcinomas from adenocarcinomas. p63 has been shown to mark approximately 5 to 10% of lung adenocarcinomas. Tripartite motif-containing 29 (TRIM29) is a relatively new marker. A comprehensive study has shown that TRIM29 is a sensitive marker (93.7%) for lung squamous cell carcinoma (SqCC) and is a fairly specific marker staining only 6.1% of lung adenocarcinomas. p63 is a nuclear stain that marks lung SqCC (DAB), and TRIM29 is a cytoplasmic/membrane stain that also marks lung SqCC (Fast Red). 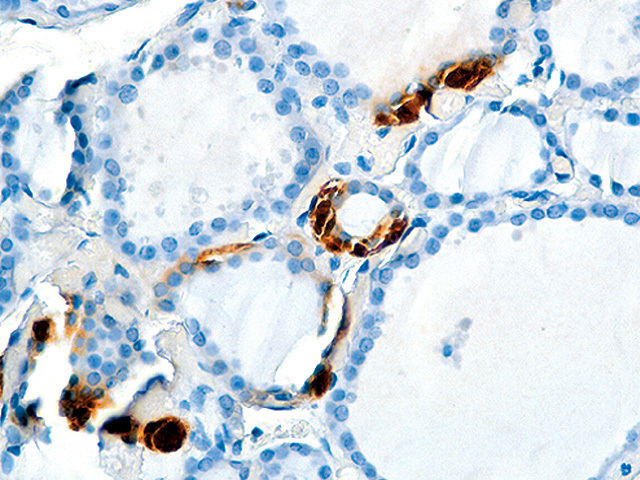 In most cases, a co-expression of both antibodies will be observed in lung SqCC. Studies have also shown that when p63 and/or TRIM29 is expressed in lung SqCC, a 95.4% sensitivity and 100% specificity was achieved, if Napsin A and TTF-1 were both negative in the same case. Therefore, the antibody combination of p63 + TRIM29 is an excellent screener for discriminating lung SqCC vs. lung adenocarcinoma. 1. Tacha D, Yu C, Haas T. TTF-1, Napsin A, p63, TRIM29, Desmoglein-3 and CK5: An Evaluation of Sensitivity and Specificity and Correlation of Tumor Grade for Lung Squamous Cell Carcinoma vs. 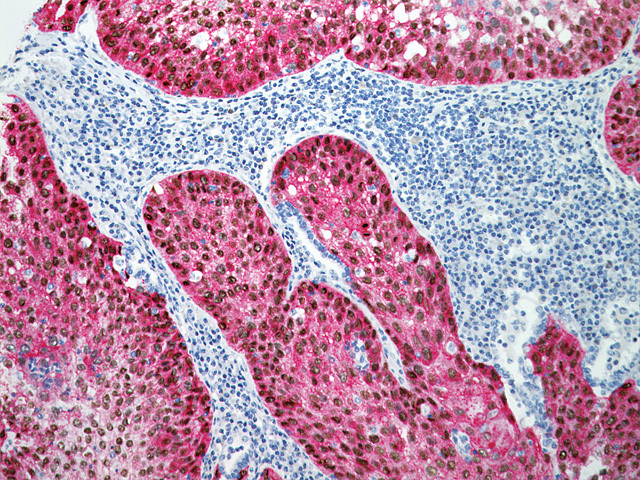 Lung Adenocarcinoma. Modern Pathology; Volume 24, Supplement 1, Feb 2011, Abstract 1808, page 425A. 2. Tacha D, Zhou D, Henshall-Powell RL¹. 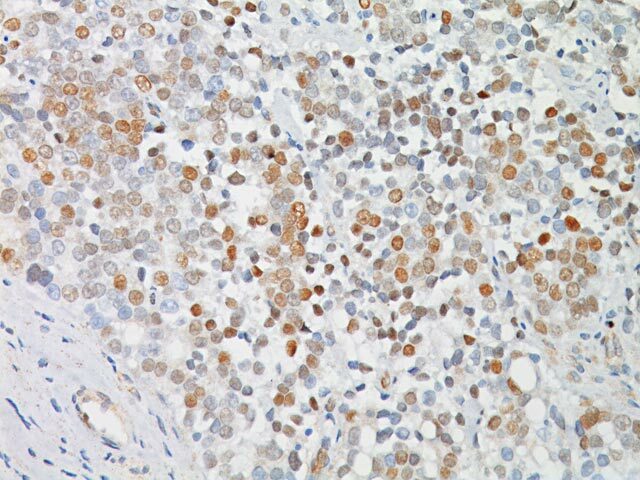 Distinguishing Adenocarcinoma from Squamous Cell Carcinoma in Lung Using Double Stains p63+ CK5 and TTF-1 + Napsin A. Modern Pathology; Pathology Volume 23, Supplement 1, Feb 2010; Abstract 1852, page 415A-416A. 3. Terry J, et al. Optimal immunohistochemical markers for distinguishing lung adenocarcinomas from squamous cell carcinomas in small tumor samples. Am J Surg Pathol. 2010 Dec; 34(12):1805-11. 4. Ring BZ, et al. 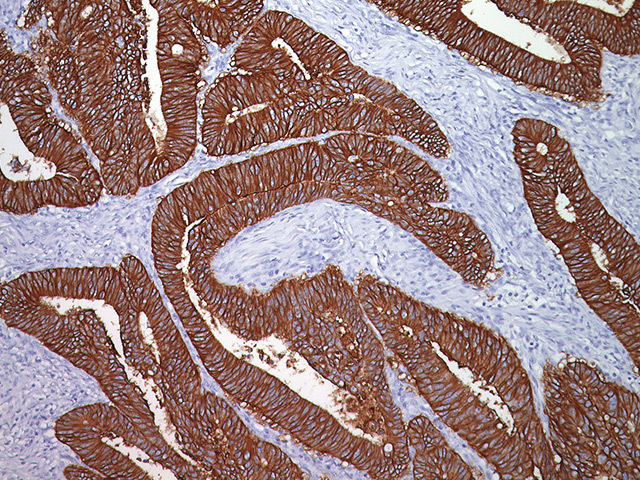 A novel five-antibody immunohistochemical test for subclassification of lung carcinoma. Mod Pathol. 2009 Aug; 22(8):1032-43. Epub 2009 May 8. 6. Clinical and Laboratory Standards Institute (CLSI). Protection of Laboratory workers from occupationally Acquired Infections; Approved guideline-Third Edition CLSI document M29-A3 Wayne, PA (2005).